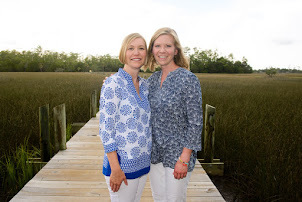 I'm certainly not a procrastinator by nature, but sometimes when it comes to sharing finished projects here on the blog, I just can't seem to sit down and get it done. 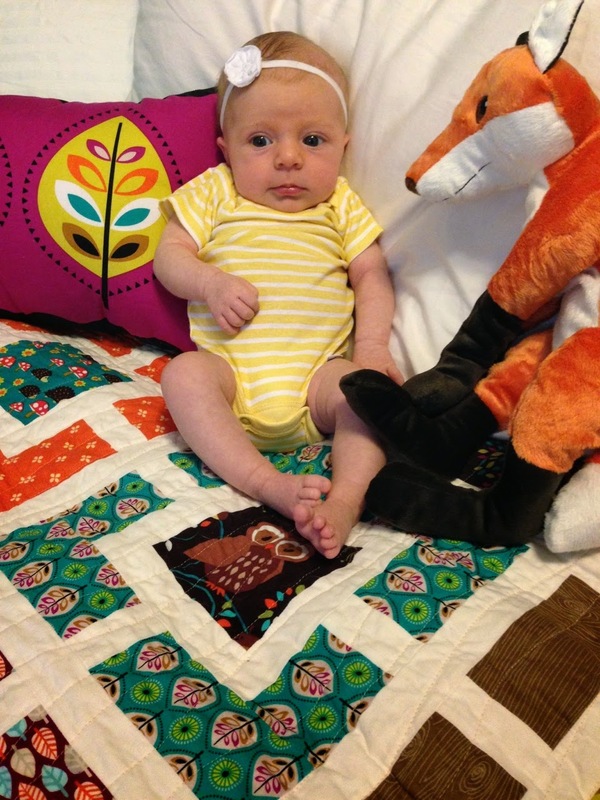 I finished this quilt in February, waited on its recipient to be born in late March/April, and now I'm finally sharing the Big Finish in May. All this delayed gratification is actually for the best, though, because now I can enter it into the Blogger's Quilt Festival, hosted by Amy's Creative Side. I'm entering my Garden Fence Quilt in the Large Quilt Category (it's twin size, approximately 63x85). Click here to view the other quilts in this category, and starting Saturday, May 24, vote for mine if you like! Some time ago, I admired this Little Apples quilt from Fussy Cut, which led me to the original Garden Fence block tutorial from Hyacinth Quilt Designs. 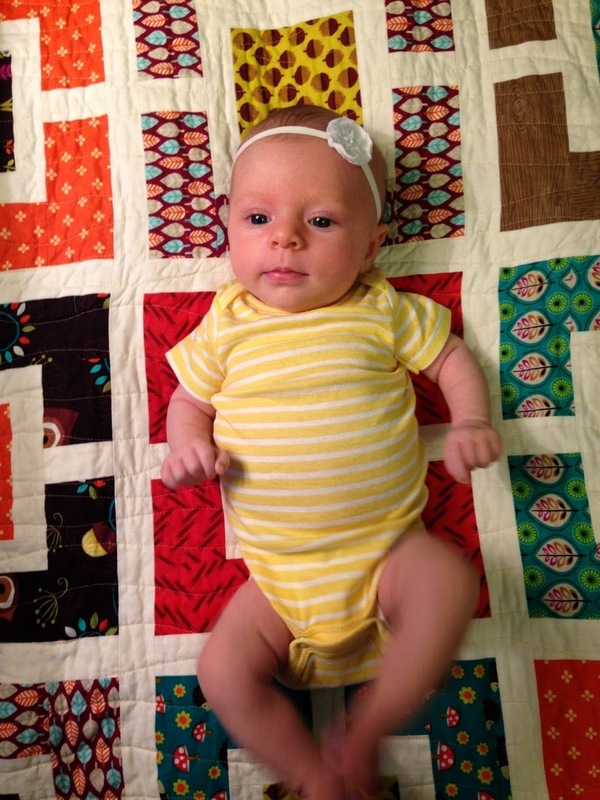 I made this quilt for my sister Emily's first baby, gender unknown at the time. 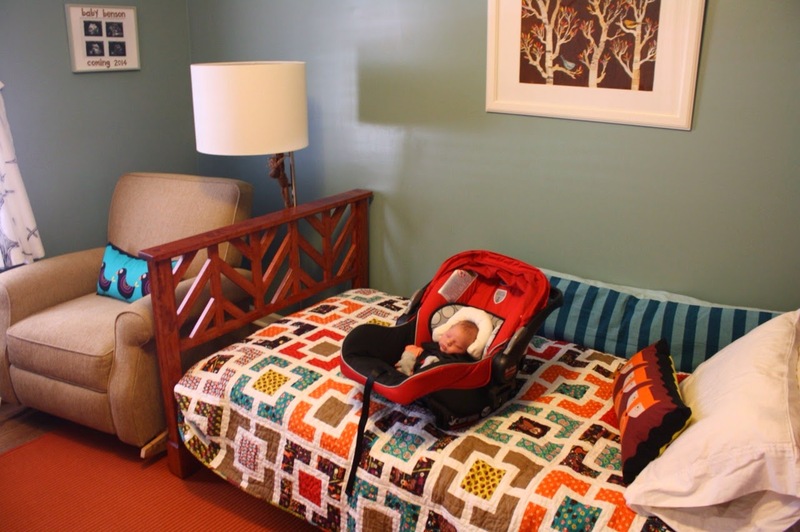 She and her husband picked out the fabrics for their woodland nursery (read more about that and the handmade items in it here), and Emily and I sat down last fall to look at blocks and patterns in order to find one she liked. We spotted this design, and I knew I had seen and liked it before. I added a few fabrics to their initial selection to balance out the mix. It's an easy block to cut and assemble (even though there are 17 pieces in each block! ), and it features the fabrics really nicely. I quilted it with wavy lines in a honey-colored thread, which worked nicely both on the busy front and the dark back. The backing fabric photographed much brighter in the sunlit photo above - it's quite dark and wine-colored in person. I finished this quilt and mailed it to my sister in South Carolina before the baby was born so that she could finish decorating the nursery. The quilt is twin-sized and made to fit a handcrafted daybed that my brother-in-law designed and built (the long back side that turns it from bed into daybed remains in progress). 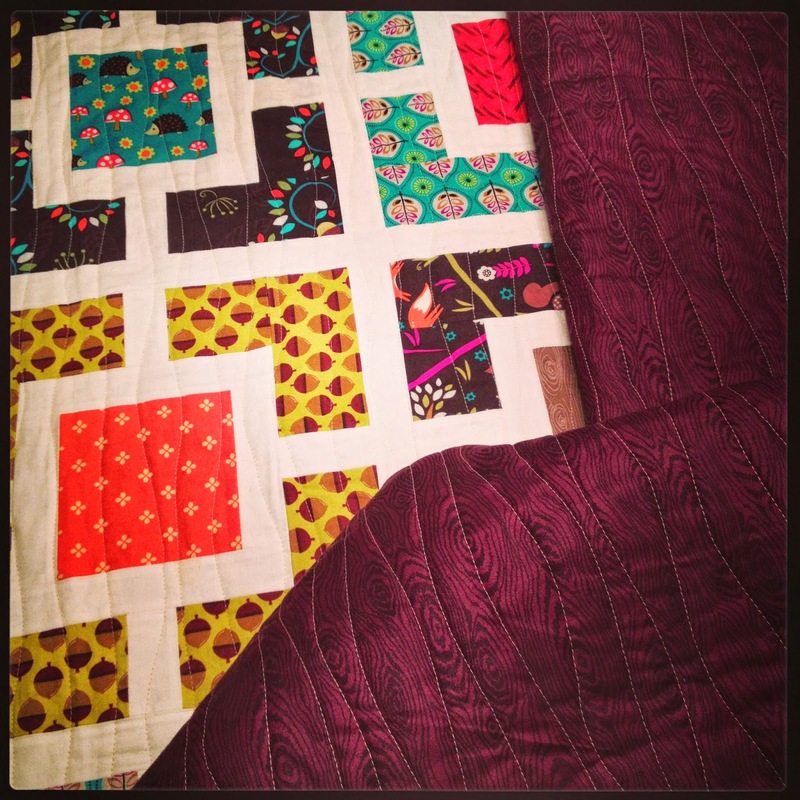 The bed and quilt are gorgeous together - well done, us. Baby Penelope arrived a short time later. Finally, this weekend I stitched up a label during a sew-in day with the Indy Modern Quilt Guild. I typically put more information on my labels, but I wanted this one to blend in to the back of the quilt, so I stuck to the basics: recipient, year, and my initials. (I downloaded a free font from www.dafont.com, transferred the text to fabric, and stitched over it. I'm never happy with my penmanship on these sorts of things.) 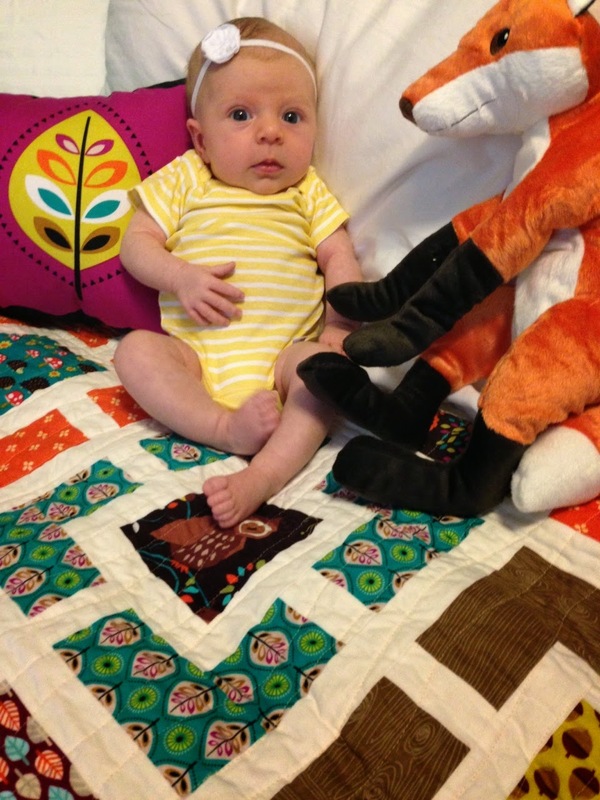 I'll sew the label on the quilt when I visit Penny (and her parents) in a few weeks. 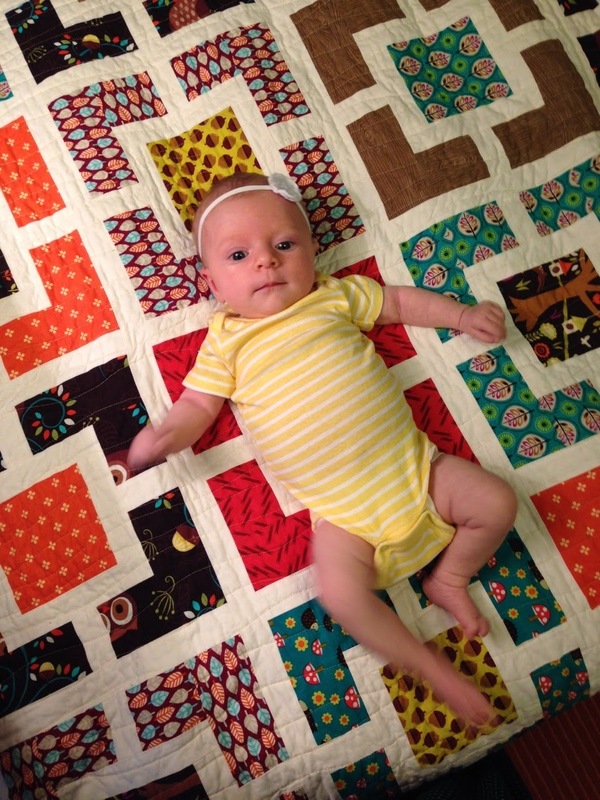 I had a great time making this quilt -- I loved the fabrics and design, and knowing it was intended for a new niece or nephew made the whole thing so much better. 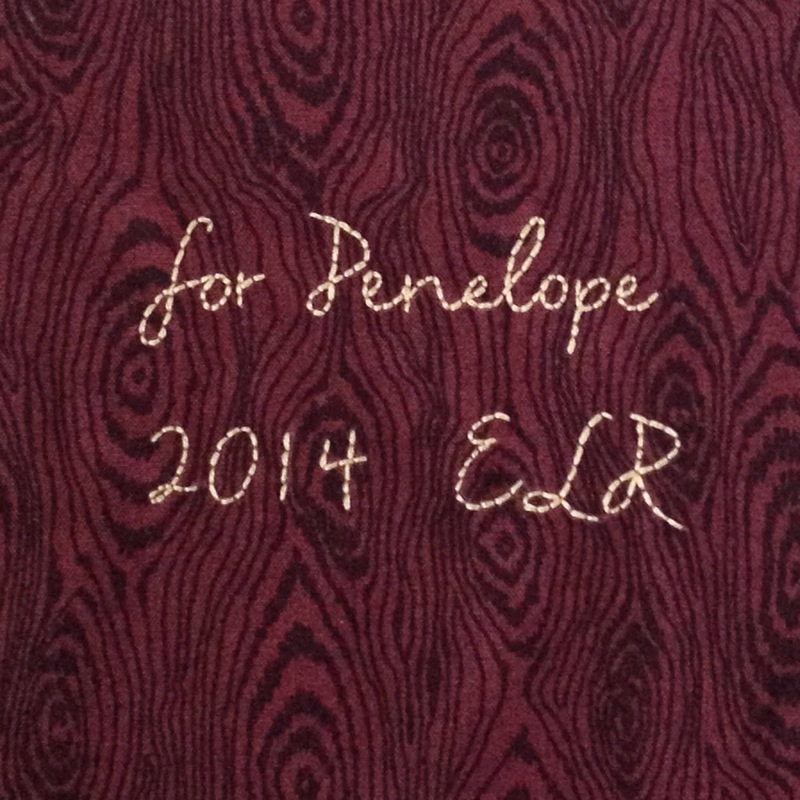 Thanks for reading, and don't forget to vote for my quilt here!